We’d love your help. Let us know what’s wrong with this preview of Civilization in Transition by Carl Jung. Essays bearing on the contemporary scene & on the relation of the individual to society, including papers written during the 1920s & '30s focusing on the upheaval in Germany, & two major works of Jung's last years, The Undiscovered Self & Flying Saucers. To ask other readers questions about Civilization in Transition, please sign up. Although I started with Vol 10, I can only imagine how meaningful the rest of the essays are. I can simply say its a book made for a world of masses that lacks a sense of meaningful existence and pure individuality. “Small and hidden is the door that leads inward, and the entrance is barred by countless prejudices, mistaken assumptions, and fears. Always one wishes to hear of grand political and economic schemes, the very things that have landed every nation in a morass. Therefore it sounds grote Although I started with Vol 10, I can only imagine how meaningful the rest of the essays are. I can simply say its a book made for a world of masses that lacks a sense of meaningful existence and pure individuality. “Small and hidden is the door that leads inward, and the entrance is barred by countless prejudices, mistaken assumptions, and fears. Always one wishes to hear of grand political and economic schemes, the very things that have landed every nation in a morass. Therefore it sounds grotesque when anyone speaks of hidden doors, dreams, and a world within. What has this vapid idealism got to do with gigantic economic programmes, with the so called problems of reality? Dar vienas galingas Jungo raštų tomas. Šįkart apie didesnius, visuomeninius reiškinius. Rašyta tarpukaryje, 3-4 dešimtmečiuose, pačiame verdančių įtampų katile Šveicarijoje, Vokietijoje. Jų refleksija suteikia daug peno apmąstymams apie žmogaus psichologiją. Jung'as vadovaujasi savo tvirtu nepalaužiamu principu: individo psichologija atspindi tautų/masių psichologiją. Įžvalgos įtikinamos. "But I speak not to nations, only to the individual few, fo Dar vienas galingas Jungo raštų tomas. Šįkart apie didesnius, visuomeninius reiškinius. Rašyta tarpukaryje, 3-4 dešimtmečiuose, pačiame verdančių įtampų katile Šveicarijoje, Vokietijoje. Jų refleksija suteikia daug peno apmąstymams apie žmogaus psichologiją. Jung'as vadovaujasi savo tvirtu nepalaužiamu principu: individo psichologija atspindi tautų/masių psichologiją. Įžvalgos įtikinamos. Growing up with the space program and the Cold War led, almost inevitably, to an interest in UFOs--a subject covered seriously by such mainline magazines as Life and Look. A child of the generation, I became an early and avid reader of everything I could find about rocketry, space exploration and, yes, UFOs, reading, from left to right, every book the Park Ridge Public Library had on its shelves about flying saucers. One of these books was C.G. Jung's Flying Saucers: A Modern Myth of Things Seen Growing up with the space program and the Cold War led, almost inevitably, to an interest in UFOs--a subject covered seriously by such mainline magazines as Life and Look. A child of the generation, I became an early and avid reader of everything I could find about rocketry, space exploration and, yes, UFOs, reading, from left to right, every book the Park Ridge Public Library had on its shelves about flying saucers. One of these books was C.G. Jung's Flying Saucers: A Modern Myth of Things Seen in the Skies. Like most, but not all, of the other books on the subject, it took UFOs and UFO witnesses seriously. Unlike everyone else, however, the author had, to me, an odd view about "objective" facts. Others saw UFOs as physically objective objects. Jung saw them primarily as psychically objective objects, as symbols of what he called "the Self" while still allowing for the possibility that they had a physical dimension as well. 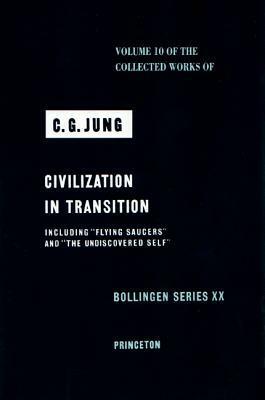 I read this book by Jung as a pre-teen, then moved on, my interest being in UFOs, not in Jung, just a "Swiss psychiatrist" so far as I was concerned--a confirming authority out of the left field. I only returned to it many years later, while in college, now interested more in Jung than in UFOs and now ploughing my way through all of the volumes of his collected works. A typically great and illuminating collection of Jung's wisdom. Most interesting are his insights into the influence of the Wotan archetype upon the people of 20th Century Europe (Germany in particular). Jung here also presents a core and vital piece of work in 'the Undiscovered Self'. We find Jung continuing some of the Nietzschean aspects of his work, urging man towards a realisation of the self and separation from the herd. Jung's employment of terms such as 'herd' and 'plebiscite's' betray t A typically great and illuminating collection of Jung's wisdom. Most interesting are his insights into the influence of the Wotan archetype upon the people of 20th Century Europe (Germany in particular). O colectie de mai multe studii de maturitate in care sunt abordate transformarile societatii in cele doua razboaie mondiale din perspectiva psihologica. Este frapanta asemanarea intre ceea ce se credea la nivel social dupa primul razboi mondial si ceea ce se crede acum la o suta de ani dupa. De asemenea este prezentata aproape profetic iminenta celui de al doilea razboi inca din 1924 desi nimeni nu mai credea in aceasta varianta. O adevarata lectie despre dinamicile colective. Amazing look at how Jung applied his theories to society and how the individual can live in a society. Carl Gustav Jung (/jʊŋ/; German: [ˈkarl ˈɡʊstaf jʊŋ]), often referred to as C. G. Jung, was a Swiss psychiatrist and psychotherapist who founded analytical psychology. Jung proposed and developed the concepts of extraversion and introversion; archetypes, and the collective unconscious. His work has been influential in psychiatry and in the study of religion, philosophy, archeology, anthropology, l Carl Gustav Jung (/jʊŋ/; German: [ˈkarl ˈɡʊstaf jʊŋ]), often referred to as C. G. Jung, was a Swiss psychiatrist and psychotherapist who founded analytical psychology. Jung proposed and developed the concepts of extraversion and introversion; archetypes, and the collective unconscious. His work has been influential in psychiatry and in the study of religion, philosophy, archeology, anthropology, literature, and related fields. He was a prolific writer, many of whose works were not published until after his death. The central concept of analytical psychology is individuation—the psychological process of integrating the opposites, including the conscious with the unconscious, while still maintaining their relative autonomy. Jung considered individuation to be the central process of human development. Jung created some of the best known psychological concepts, including the archetype, the collective unconscious, the complex, and synchronicity. The Myers-Briggs Type Indicator (MBTI), a popular psychometric instrument, has been developed from Jung's theory of psychological types. Though he was a practising clinician and considered himself to be a scientist, much of his life's work was spent exploring tangential areas such as Eastern and Western philosophy, alchemy, astrology, and sociology, as well as literature and the arts. Jung's interest in philosophy and the occult led many to view him as a mystic, although his ambition was to be seen as a man of science. His influence on popular psychology, the "psychologization of religion", spirituality and the New Age movement has been immense.